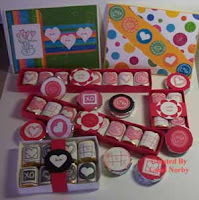 Stampin Carol: Valentines Day is Coming! The last couple of days I have been working on my Valentine stuff for our 3 kids, 2 granddaughters, and my folks and here is what I came up with. I still have a couple cards to make but I was wanting something non-traditional and bright in the card department. I made the boxes for the nuggets out of cardstock and used mailing labels to stamp on and wrap around the nuggets. They are lightly taped to the bottom of the boxes to keep them in and the bands just slide over the boxes so they are easily removed. The Peppermint Patties have assorted stamped circles taped to them. I used the 1" Circle Punch, the Extra Jumbo Circle Punch, Corner Rounder Tonic Punch, a heart and scallop flower punches, Love Doodles, Friendly Note, and Tag Tidbits stamp sets, Palette Hybrid Inks, Kaleidoscope Girls and Kaleidoscope Boys Wing It Collections, white, Harvest Orange 2 , and Red 1 cardstocks, and Prismacolor 36 Watercolor Pencils. Needless to say, my mom came over while I was taking this picture and I had to keep her out of my creative lab. I'm sure she was wondering what I was up to. Guess I need to quit playing and go empty the dishwasher. Oh, the drudgery of housework! Catch you all later! Hope you have a great weekend! Love your valentine items. Too Cute!! "invalid email" message also. I do have a google account so don't know...hope you're able to fix it.